Dr Judith Wester of CEDAR participates in international Dead Line exhibition in Bristol produced by performance artist Jo Bannon. What are the questions that keep you awake at night? What are you afraid to ask about your own mortality? We can’t talk to the dead but we can talk to the living. Dead Line is a live encounter for audiences that creates a space to talk a little more openly about fears, hopes and desires for the living and dying. Jo Bannon is a performance artist and producer who set up the wild and wonderful performance art project called Dead Line for the IBT 13th International Festival of Performance in Bristol, UK, which took place between 15-17 February 2013. Participants would book ahead during the festival and reserve a ten-minute slot with a death expert, of which Dr Judith Wester of CEDAR was one such expert. They would enter a space fronted on the Bristol city high street and move through a series of rooms with artwork and music focused on the topic of death. Eventually the participant would end up alone in a room with a desk, chair, pen and pad, and one red telephone. When the telephone rang the participant was connected to one of eight death experts who participated in the project. The participant then had ten (sometimes fifteen) minutes to ask the expert any questions they wanted around the topic of death, dying, and/or disposal. Because we can’t talk to the dead but we can talk to the living. Dead Line invites you to confront your own mortality, to ask another what you daren’t even ask yourself. A one-to-one encounter which will help you sleep at night. 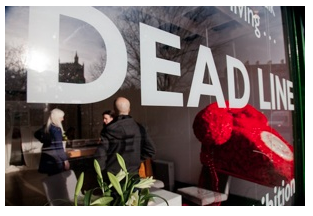 Dead Line is a publicly sited work, which is part-installation, part-theatre performance, for one person at a time. Dead Line is a live encounter that creates a space to talk openly, or a little more openly, about our fears, hopes and desires for living and dying. Some thoughts on the making of Dead Line can be found here.